Your eyes are an essential part of your life and yet you often fail to take good care of them. Poor eye care often causes a lot of problems and tends to deteriorate your eye sight sooner as you age. Here are 5 tips that will help you keep your eyes healthy. 1. Always Wear Sunglasses When Out in the Sun: Sun glasses protect your eyes from the damaging UV rays, so make sure you wear them when you're out in the sun especially during summers. 2. Avoid Staring at Your Computer Screen: Staring at your computer for a very long time can lead to dry eyes, blurry vision, headaches, and shoulder pain. If possible use anti-glare screens and keep your computer in such a position that your eyes are in level with the top of your monitor. 3. Maintain a Healthy Diet: A well-balanced diet is a must for healthy eyes. Include vitamin A rich green leafy vegetables, orange or yellow colored fruits, and healthy nuts in your diet. 4. Take Care of Your Lenses: One must take good care of their contact lenses. Always clean your lenses with a lens solution to avoid infection. Avoid wearing your lenses when your eyes are irritated and wash your hands thoroughly before putting on and removing your lenses. 5. Relax Your Eyes: If you tend to spend a lot of time in front of the computer, your eyes may get tired quickly. Follow the 20-20 rule to relax your eyes i.e. after every 20 minutes look away about 20 feet in front of you for 20 seconds. 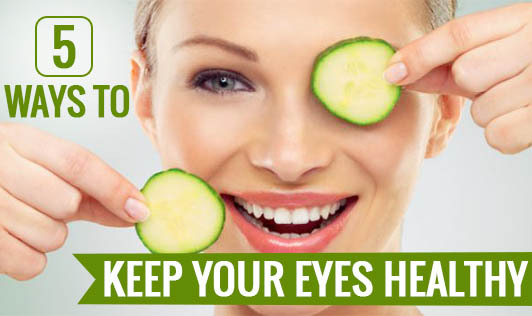 This trick not only helps you relax your eyes, but also maintains the moisture level in your eyes, reducing eye strain.